This documentary's scope is remarkable, and the presentation is powerful considering that it was created around 1968 to 1971 when there was much classified information yet to be released. To me a compelling aspect is the fact that it humanizes the conflict through the interviews with participants and survivors. I found particularly interesting how the Japanese infantryman and pilots viewed the war. You come to realize that there are human beings on both sides of the story... people like you and me. Stunning also are the interviews with Adolf Hitler's secretary. She provides a fascinating insight into the daily routine surrounding one of history's most notorious men. Another remarkable quality is this documentary's sound track. The music is superb, and it evokes powerful emotions throughout the series. Many of the pieces are haunting and well positioned during the narrative's course. Even after thirty years the music sounds fresh, unique, and evocative. View one of the late episodes and listen to the music as paratroopers drop into Germany. The music and the pictures tell the story without narrative, but this combination is compelling without any language. Finally, the photography provides images of the challenge, struggle, and horror that was the Second World War. It is nothing like the sanitized pictures from the cinema and the propaganda from this era. To this day I cringe when I see the film of the flies and the insects that plagued both sides during the North African campaigns. How did these men and these women live in such difficult conditions? 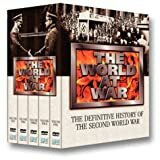 If you invest the many hours needed to watch this documenary, then you will understand the War's horror, this conflict's historical aspects, and how it has shaped the world in the twenty first century. The best movie I've ever seen! Frankie is a wonderful woman who is somewhat "on the dark side but aims for good." This is the story of her search to find her soul mate. She says that life is mediocre and love should not be. In fact, anything less than extraordinary is a waste of her time. She knows how to llive life to the fullest and this is a wonderful movie. - he certainly managed to raise a mentally and emotionally stable daughter with a healthy hormone balance. Faced with the first men she's ever seen, outside of Daddy and pictures, she responds with enthusiasm; "You're lovely, Doctor, but the two on the end are incredible!" What girl wouldn't appreciate having a flying saucer full of healthy, hunky spacemen land in her backyard? Pity the Creature from the Id has to crash the party and spoil her fun. There has been a spate of fin de siecle films that have sought to undermine the general gloom and doom spectre of the Nazi regime. To take any other than the orthodox view is courageous and especially edifying as the films emanate from the occupied locales of suffering. 'Underground's' carnival flavour was festive at times, though I found the misogyny disturbing even accepting the plausibility of the plot. 'Life Is Beautiful', was really a supreme one-liner. But Jan Hrebjk's,'Divided We Fall' I'd nominate as the best of the bunch, for its farcical ferocity. The Czech town is occupied by Nazi invaders and its power structures, class and race, are inverted. The script is tight, tingling with one-liners, and given embodiment by a brilliant ensemble of lead characters. The reluctant hero, Joseph (the droll Bolek Poliuka)who'd rather have slept the duration of the war in hope that life would return to normal, is thrust to defend his Jewish neighbour. His valour, therefore, is dragged from him. Honour, allegiance, morality - all community values are deeply questioned, and definitively framed by their former friend, now a Nazi collaborator, who, in praise of Hitler has adopted the fuhrer's hairstyle down to the moustache. He's an ingratiating fellow who leeches after Joseph's wife. So many swift and sudden shifts of affiliation occur. The German Commandant, more than any Czech, is totally undone by the loss of three successive sons to the slaughter, and his wife to the asylum. Never has a title been more apt. This moves with the speed of Fawlty Towers and in the gangling Poliuka draws a touchingly real story brimming with comic insights and naive, good intent. I can't recall a film since,'Jesus of Montreal' that so exquisitely incorporates a Christian tale. Here, the 'miraculously' conceived infant, promotes a vision of resurrection in 'father', Joseph of the reunited family of the Commandant. Even during this epiphany,Hrebjk mischieviously has the infant peeing in his dad. The Germans sit at a table midst a pile of rubble. It's a climactic guesture of reconciliation and forgiveness. This is one of my favorite movies ever. It portrays the book beautifully. The other two Anne movies don't follow the plot of the books and aren't as good but if you love Anne they are still worth watching. The actors are amazing, exactly how I picture Anne and Marilla and Matthew and Diana and Gilbert(cute!). You laugh, you cry. It's really wonderful cause I'm 15 and my moms 53 and we both love it. The music is so beautiful and really ties it together too. Read the books, watch the movies, get the soundtrack. When the fifth season of Angel premired on the WB unbelivible things where happening and continued the happen all the way up until the final episode. Although viewership had gone down in season 4, and the rating for Angel's fifth season where the highest the show ever saw (and it was up against the breakout show of the year "the oc"). But in Febuary on 2004, despite all the high ratins, the WB announced teh cancellation of the show. For Three months following thousands of fans protested the cancellation and tried all they could to get the show to continue. Unfortunatly, there efforts didn't realize any results beyond the small promise of TV movies (which have been looking less and less likely). But getting back to the fifth season, the story continues about 22 days after the events in the season 4 finale (and about 19 days after the events in the buffy the vampire series finale) and finds the gang working at wolfram & heart trying to figure out how they can use their new toy to help the helpless, but then Angel gets an unexpected packing containing an old friend (or enemy depending on how to look at it). Despire loosing one of their strongest assets (Charisma Charpenter, who reprises her role of Cordelia Chase in episode 100 for Cordy's last Hurah) the fifth season is a pretty strong season, and one of the best in the buffyverse. Coming off the heels of the cancellation of Buffy, their was alot of pressure on Angel to continue the Buffyverse, which it did perfectly. The season was made up of many "stand-alone" episodes which suddely started an overlaping arc (which was to continue into season 6) and also dropping hints as the the whereabout of are favorite scoobies. The one complant many fans seem to have is how the last 3 episodes of the show seemed rushed, which they do. Whedon and company basically had to put a season's worth of episodes in the space of 3 episodes to end the series, which under the circumstances they pulled of well. - "To Live and Die in LA: The Best of Angel"
- "Halos and Horns: Recurring Villianry"
- "Angel Unbound: The Gag ReelS"
This movie is both a work of art and a perfect movie translation of H. G. Wells classic novel. So great an impact it's made, the images haunt me. It was fabulous. Provoking, painting-like effects, a strange tale told in an original way. There's nothing cookie-cutter about this movie. It's the true telling of the novel. Hope you can see past the joke reviews and take pleasure in it too. The DOH is one of my all time favorite TV shows and I'm thrilled to have it on DVD at long last. The entire shows are included, from the beginining to the credits and the great sound bytes in the end of the credits. My only gripe about season two was that an episode or two are out of chronological order. There is an episode about Uncle Jessie in jail for stripping cars when it's actually a gang of girls. It's also the first appearance of Huey Hogg in the series, but the problem is that Daisy already has Dixie(her jeep) in this episode and the episode where she actually gets Dixie is several episodes after it. Generally when we think of the war drama's of yester-yore, images of a patriotic John Wayne pops into our mind, or a high pitched whistle of Dave Lean's entertaining but falsely sentimental "Bridge on the River Kwai" forces itself in our ears. Both Hollywood and the most uncompromising film directors know that there are rules that seperate a propaganda picture from a Anti-War film. And these rules were doctored not from Lean, or Lewis Milestone, or anyone one else who earned profit for Sunset Boulevard, or Oscar bonus points, they were doctored in 1957 by the greastest of all AWOL-Hollywood directors: Stanley Kubrick. The influence of "Path's of Glory" is astounding. From the conflict between the General eating crumpets who orders the Captian to carry out a suicial charge (a theme later seen in great anti-war pictures such as Terrence Malick's "The Thin Red Line" and Peter Weir's "Gallipoli") to the fact the Kubrick never allows the Germans to be seen (a frame of reference played out in countless movies based on Vietnam) until the antagonist side has seemed to have inverted an enemy of itself. Like so many other Kubrick movies, "Paths of Glory" is a cinematic work of genius, that will probably be underrated because it has been so little seen (popular cliche's like "Private Ryan" will unjustly top the war film list of many-so-ingorant film critic, in the next decade).But those who have witnessed this masterpiece, will immediatly realize it's importance.